Ancient. Timeless. Mighty. - Mjolnir (“Lightning”) is the magical weapon of Thor, the red-bearded Norse god; friend to all of Mankind. Forged by the dwarves Sindri and Brokkr, Mjolnir could take out the greatest of giants and helped Thor in his unwavering defense of Midgard against the forces of chaos and evil. 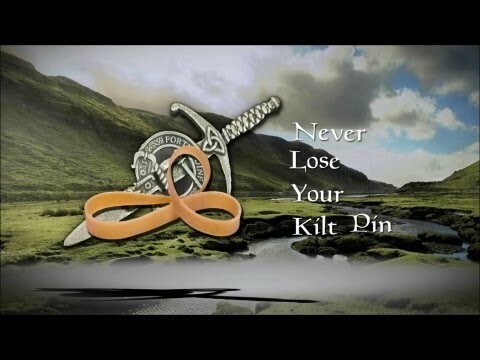 This gorgeously-crafted kilt pin captures the Nordic spirit of strength, courage and adventure. A jaw-dropping accessory for anyone with viking attitude, but especially appropriate for members of Norse-descended Scottish clans such as Gunn. 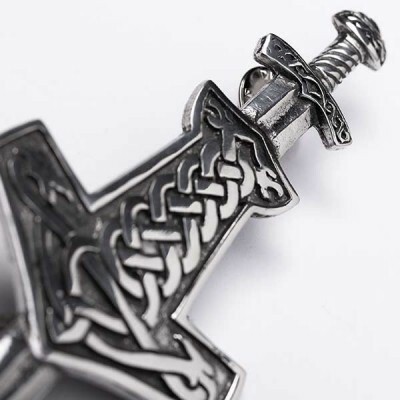 The Hammer itself is full of Celto-norse knotwork with dragon heads, and is set against a lovingly detailed traditional Viking sword. Cast in the UK from high-quality pewter -- measures a whopping 4" tall x 1.875" wide!